Nagasaki, Japan. September 24, 1945, 6 weeks after the atomic bomb attack on that city, the second atomic blast in history. 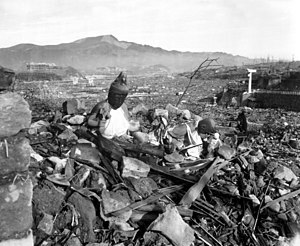 English : Nagasaki, Japan. September 24, 1945, 6 weeks after the atomic bomb attack on that city, the second atomic blast in history. The Golden Gate Bridge as seen from Fort Point on a foggy day. English : The Golden Gate Bridge as seen from Fort Point on a foggy day. The 3D-Cinema L'Hemisfèric in Valencia, Spain. English : The 3D-Cinema L'Hemisfèric in Valencia, Spain. Kings Creek in Lassen Volcanic National Park, California, USA. English : Kings Creek in Lassen Volcanic National Park, California, USA. Summer field in Belgium. The blue flower is Centaurea cyanus and the red one a Papaver rhoeas. English : Summer field in Belgium. The blue flower is Centaurea cyanus and the red one a Papaver rhoeas. The Church of the Holy Wisdom, commonly known as Hagia Sophia in English, is a former Greek Orthodox church converted to a mosque, now a museum, in Istanbul. It is universally acknowledged as one of the great buildings of the world. English : The Church of the Holy Wisdom, commonly known as Hagia Sophia in English, is a former Greek Orthodox church converted to a mosque, now a museum, in Istanbul. It is universally acknowledged as one of the great buildings of the world. German House, in Blumenau, Santa Catarina, Brazil. English : German House, in Blumenau, Santa Catarina, Brazil. English : Flag of Turkey. Balneário Camboriú Skyline, Santa Catarina, Brazil. English : Balneário Camboriú Skyline, Santa Catarina, Brazil. Wine grapes from the Guadalupe Valley in Ensenada, Baja California, Mexico. English : Wine grapes from the Guadalupe Valley in Ensenada, Baja California, Mexico. Galeazzo Maria Sforza, duke of Milan. English : Galeazzo Maria Sforza, duke of Milan. English : Sailing in Helsinki, Finland. English : Happy New Year!